Orange Sticks for Manicure & Pedicure. 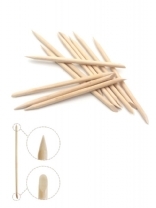 One side of the stick has a pointed end, while the other has a flat angled shape similar to a flat head screw driver. Both sides have a variety of applications. Wood. Weave cotton between toes for a comfortable and lint-free pedicure. 6" ropes are made from soft 100% cotton. They are comfortable, sanitary, disposable and biodegradable. 10 per pack.